This sounds good to me! Sorry I missed this past year. And two of them actually run! Looking forward to it. Sounds like we might have a few more Jeeps the next time. Do you, by chance, have dates for this year yet? My wife and I are making our plans for the coming year. I will see if I can nail down the dates for this years Ohio Fall Color Tour. I was thinking we could move it back to the end of October or early November to see if we could hit the height of the fall colors. As for open seats - it is hard to say - all depends on who shows up. Ruff and Rec53 sorry about not responding sooner. Ohio Fall Colors 2019 - It looks like October 19, 2019 is the date for Ohio Fall Colors 2019 (third Saturday in October like last year). More details as we get closer. Note: The ride is on unmaintained township/county roads near Tar Hollow in Ohio. 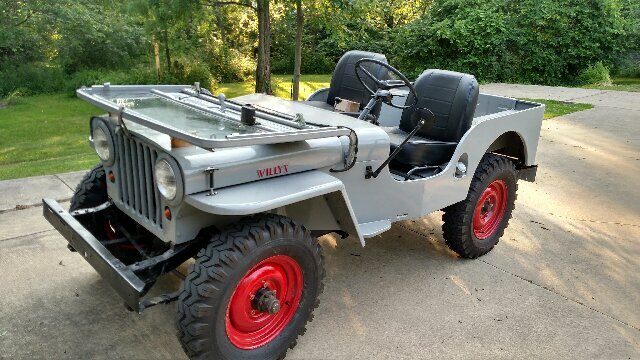 This is a Willys Flat Fender only ride. Vehicles need to be insured and licensed for use on state roads in Ohio. Vehicle operators/owners are responsible for their property, safety and their decisions. Stev, Have you ran the trails recently? October 2016 was the last time I was down there. From the 2 local Clubs I hear the trails are getting pretty rutted out and more difficult. I'm hoping to run the trails a couple of times before October and do a little bit of scouting. Rec53, we might have a open seat available. I'm working on getting my 47, another 46 2a's reliably operational to go along with my blue 46 and my 56 DJ3A. We have not been out there since October 2018 - they were fine then. These are township roads. But the Razor guys were out there - not to say they tear things up but I don't find a lot of Vintage Willys Jeep guys wanting to grind hills or tear up their vintage Jeeps. Old Jeep guys are more - Jeep softly and be safe -- not grind and destroy roads. Please report back with what you find. We only had to winch ourselves up one road. Albright Rd was passable. One of the roads off from C17 on the South side (heading up the steep hill) was were we winched all the old Jeeps (lockers, Powerloc and open differentials). If you look at the pictures the "V " is where we winched. The rest of the roads - I would say looking back at the photos are passable -slippery and challenging but nothing experienced drivers with Willys Jeeps would not take on.